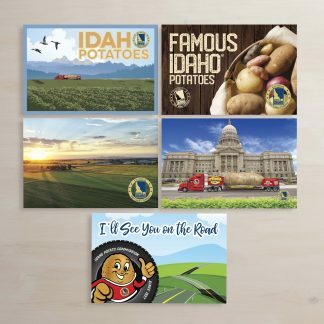 I bet if I told you that the Famous Idaho Potato Tour had been in the Sunshine State all week you would imagine white sand beaches, lanky palm trees, and clear skies for day. Well, keep dreaming. And if you are looking for the part of the blog that has these things then please skip down to paragraph five. For those of you who don’t know, Debbie is the name of a tropical storm that filled the beginning of Florida’s week with a horrendous showing of rain, floods and tornadoes. 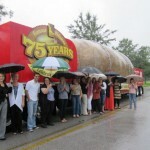 Even those on the outskirts of the storm were subject to the violent weather, and the Tater Team was scheduled to meet her head on in Tampa. The behemoth potato and tropical storm were in a classic game of chicken… only one would survive… and that’s when Debbie backed down. She veered north of the tour, saving herself the humility of losing to an overgrown piece of produce. But she did get a few good licks in as she thoroughly soaked the Tater Team’s worldly possessions. The team was quick to learn from her scorn and even quicker to move on. After she passed by there was nothing but blue skies and extreme humidity for the rest of the week as the team made stops in Orlando and Tampa. 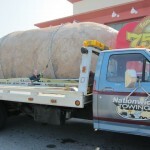 After their shark tooth adventure on Sunday, the Tater Team ventured even further south to Orlando. 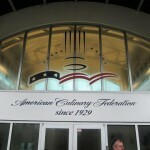 Along the way they stopped off for a quick office visit at the American Culinary Federation’s (ACF) Headquarters. It was raining hard enough to keep most people inside (despite there being a 12,000 pound potato outside) but the staff was ready to rock; rain, shine or snow. The enthusiastic bunch provided a great start to the morning, and the team was in high spirits when they hit the Sedano’s in Orlando. 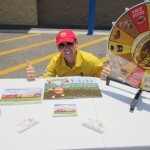 Ellis was very happy to find out that a large number of Latino’s frequented the store, which gave him ample opportunities to embarrass himself with his rusty ‘Español.’ The crowd, however, was very accepting and couldn’t help but be amazed by la papa grande! Despite the bad weather there was another very special group of people that came out and saw them. Who might that be you ask? Well none other than the folks from Go BIG or Go Home Travel Blog. They found us on Facebook one day long ago and it has been a match made in heaven ever since! Some may even call them our BIGGEST fans! They run a travel blog that features the biggest ‘things’ out there. They have looked up and developed categories that you would never even imagine! It was by a very unfortunate chance that we missed them while in their part of the world (the New York area), but somehow fate decided to bring us together down in Orlando, Florida. While on a family vacation experiencing much of the world’s biggest ‘stuff’, they were able to squeeze us in and ‘ketchup’ with us despite Debbie’s best efforts to keep us apart. 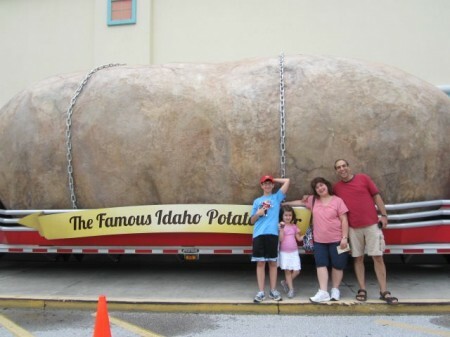 Debbie’s relentless determination to oust the Tater Team and their gigantic spud kept everyone on their toes up through Wednesday. 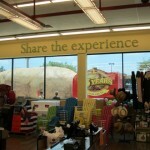 The powerful Florida downpours even pierced the Big Idaho Potato and soaked clothes and boxes to the bones. But the team fought back. They doubled up on ingenuity and tripled up on tarps as they successfully saved swag and prizes that would one day belong to their beloved fans. With everything wrapped up tight they even decided to give the truck bedding a good wash for the first time in three months… don’t judge them. 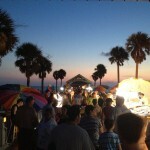 But just as they finished reinforcing their stronghold… Debbie moved north. It stopped raining and the sun started shining just as they headed to the coastal city of Tampa, which, I guess, means that she got the last laugh after all. The sunshine that came after Debbie left seemed to bring Florida back to life. 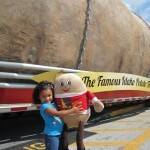 Things became as they should and people were back on the hunt for the world’s largest potato. 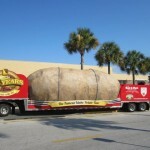 People were showing up to the events who had seen it drive by, looked it up online and then tracked the spud down to make sure they weren’t crazy! 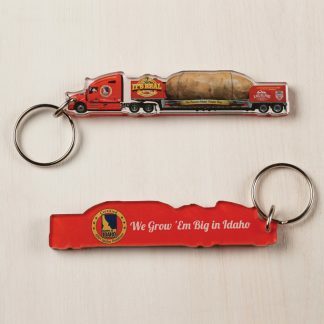 One lady (we call her Ginger on Facebook) loved Idaho potatoes so much that she tried to roll ours onto her Nationwide Towing truck! 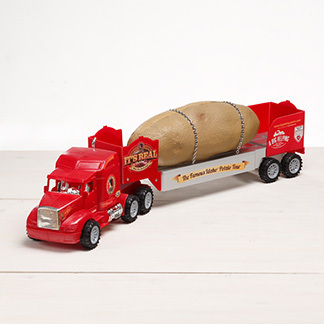 But once the team got her calmed down she decided to let them keep the potato, thankfully, in exchange for a little Spuddy Buddy. 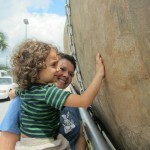 The sweet little lady turned out to be most endearing and was rightfully dubbed the Fan of the Week. By the time the team finished their events on Saturday they were ready for the weekend. But this weekend would be different. 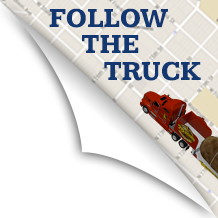 Gracie Bingham, from the Idaho Potato Commission, was sent down to spend a week with the Team and experience first-hand what life is like on the road. She was welcomed with open arms at the terminal and prepped for a very rough first day on the job (heavy sarcasm). 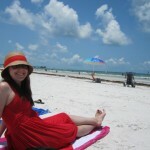 Her first full day on the job consisted of going to the beautiful Clearwater Beach just east of Tampa. 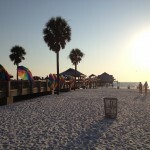 The white sand beaches, warm gulf water, delicious seafood restaurants and evening booths at Pier 60 lulled her into a false sense of relaxation. Little did she know that she was in for a very busy week… but of course, she was ready for the challenge.